This is a guest post by Lisa VanRaemdonck, Executive Director of the Colorado Association of Local Public Health Officials, and vice chair of the CCMU board of directors. I’ve been thinking about swimming pools a lot lately, which is certainly odd because I don’t really know how to swim. I’m not afraid of the water, I just never had easy access to a swimming pool while growing up in a small town. And even though my home state of Michigan has plenty of great lakes, they were for splashing and jumping around in the waves, not for learning to swim well. 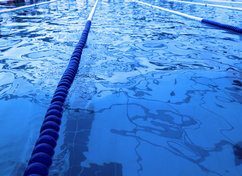 I have also been thinking about strategically using analogies in my work, so it seemed fitting when a public health colleague of mine said, “well, it’s sort of outside of our purview, maybe we should stay in our swim lane,” in a recent conversation. So, naturally, despite my lack of swimming prowess, I started thinking about the people and organizations in our health system in relation to a swimming pool. The image in my head was an indoor swimming pool at a community center with a bright turquoise liner that gives a certain hue to the pool water. The air is humid and smells of that characteristic chemically treated swimming pool smell, and there are always sounds of children giggling and lifeguard whistles blowing. And I pictured us—primary health care providers, payers, public health professionals, hospitals, specialist providers, behavioral health centers—as individuals all in our own swim lanes. I thought of the water as our patients, clients, community members—flowing around us and through us. Not owned by any of us. Holding us up. And us, working hard to move through and with the water. Then I thought, why are we there? And why are we in lanes? Is it a race? Are we competing with each other, ourselves, or both? What happens when we accidentally wander into each other’s lane? Or when a situation, say for instance when we integrate physical and behavioral health, puts us in a lane together? If this is a realistic depiction of some of our health care systems and processes, is this how it should be? Distinct, separated, competitive? Or do we need to open up the whole pool and start learning synchronized swimming together? Law, regulations, incentives, core missions, shareholders—so many of these things drive us to keep the lanes. The lanes can be easier when we are all headed in a straight line and staying out of each other’s business. The lanes can be easier to explain and we know where we are supposed to be. The lanes help us have structure and keep us from being overwhelmed by the entire pool full of water. Some recent system transformation efforts are trying to remodel the lanes, even force us to share lanes, but are these efforts going to be sustainable and sustained? When the incentives to swim differently go away, will we still want to? There are places where this analogy quickly melts away because one of our biggest challenges is the water. Our patients, clients, community members. Their lives aren’t placid water sitting quietly in a pool, surrounded by calm air, waiting for us to jump in. The water we work with is the ocean. And it’s filled with wave patterns, currents, tides, underwater volcanoes, and hurricanes above. If we try to swim on our own in the ocean the way I envisioned us in the pool, we are sure to drown and there aren’t lifeguards. So what do we do? We build boats, of course! We tie our dinghies together, we build multi-disciplinary boats of collaboration, and learn to ride the ocean, rather than try to stay in our swim lanes. I’ll let you take that analogy out for paddle on your own.